Taken from the album "Rush"
I first heard this song at a funeral. and it broke my heart. I remember first hearing Eric Clapton through wonderful tonight and I thought he was genius with that. but when I heard this song I was truly touched. I heard this tragic story when I was a child and my mom was touched however I didn't understand so much, but now that I understand. I truly believe Eric Clapton is a wonderful and talented artist. He touches people on a personal level. This song will live on forever. This song is by far the best I have ever heard in my life. "Tears in Heaven" reminds us of how Eric Clapton felt after his son died after falling out of a hotel window. He is magic. My heart brakes down and my soul grieves, my eyes are filled with tears. No matter the time, no matter the place, every time I hear this song, it is the same feeling to me.. I picked this song for my son Callum's funeral, after he was born sleeping 5th September 2007. The words are so beautiful and seemed so perfect. I then found out afterwards from my dad, that it had been written by Eric Clapton after his son Connor died. How weird. This song I think that its one of the best that i have ever heard I love it I almost lost somebody that was extremely close to me and this song makes me think of him every second that it plays this song is a great example on how music effects our emotions. I just want to say that "Tears in Heaven" is the most beautiful song. I lost my son in December and we played this song at his funeral. I just want to thank you for sharing your song that you wrote for your son with us. Thank you and God Bless You!. This song has touched many hearts and brings back memories of my past that i woul very much like to forget. Your song 'tears in heaven' is one in a million even though the song was written in grief. This song makes me remember people i have come to love and have past though my heart and made its way to heaven. You are truly one in a million eric clapton. there wouldnt be a dry eye in the heavens when this song is sung. Memories are what keep you goin never forget the bad cause with the bad comes good. Eric Clapton knows what it feels like to have someone you love die. His song tears in Heaven could not make that message plainer. the song is truly heart wrenching. I absolutely agree with everything that has been said on here already. I am not normally a great modern music fan, but I was listening to a version of this by The Choirboys, and it was one of the most beautiful, heart-wrenching songs I have ever heard. The boy who was singing managed to put so much meaning into the words, as if he really understood. Bravo, Eric! We just lost our beloved son unexpectedly at the age of 24. He was a very sensitive soul and gifted hockey player and MENSA IQ. He loved children (and animals). As such he donated many hours to teach young children to skate. He absolutely LOVED this song and in fact introduced to my husband and I the history behind the song. My son was so touched by it. It was played at his funeral just 2 short weeks ago and we are including the lyrics in the thank you notes. We play it every night before crying ourselves to sleep each night. The pain of loosing a child cannot be expressed in words but Eric managed to do the best I have ever heard. THANK YOU ERIC! We have established a foundation in our son's name "Dustin" to send underprivileged children who want to learn to skate to hockey camp. This foundation will continue the life's passion of my son. Again "thank you Eric." The "brass-tacks" of music is how it can play with our emotions. Dance tracks have people up and dancing and bopping around to the rhythm feeling all the joy and fun that dancing brings. It's pure fun and a joy to us. I guess that opens up a wild field of showing our art, our mood and is an outward emotion of those feelings we have inside. Yet many songs are recorded that do much more than that. Some make you dance inside your heart and some make you smile. Others take you off somewhere or to some place inside yourself and the song "speaks" to you. There are so many instances of that in a myriad of songs in recording history. "Tears In Heaven" is a classic example of such emotional feelings taken to a song, and from inside there Clapton takes you inside his heart ... maybe some forget that aspect. I don't think for one moment he wrote this song for himself, more that he shared it with all. It was a declaration of his feelings of that time and he gave anyone the opportunity to look inside him and his feelings. It's a song I sing lots of times. I feel it and sense it when I do sing it. I cannot say I could feel what Clapton felt at that time, but I can sense it and it speaks to me. Heart wrenching it is, of that there is no doubt, and his heart went into those lyrics. Who could fault that. Music can lift you up when you're feeling down, it can bring you down (emotionally) when you are feeling up. That's what music does. It's a drama, a serenity, a comedy and a celebration. When we listen to them we are sucked inside the words we hear and we enter someone else's reality. "Tears In Heaven" is one heck of an example of what music can do to us. It's a song that will always lurk in the history of what music itself and how music can effect us all ... and that is where it deserves to have it's place. I think this song is honestly, one of Eric Clapton's best. Which is hard to pick from with all the great songs that Eric Clapton has produced. I'm 14, and a lot of kids my age don't even know this song, but I do. My dad died of pancreas cancer in November of 2004, and I think about him every time I hear it, because he use to sing it to me all the time. If I could do one thing in life, it'd be to meet Eric Clapton, he's a great guitarist and an awesome song writer. Bad props to Eric Clapton for "Tears In Heaven. Wow OMG Tears in Heaven is the absolutely best ever song. I first heard it when I was about 3 but I can still remember the day I heard it and since it has been my favourite ever song. I cant get sick of it. I have made my mate learn to play it on the guitar I'm not sure how he is coming along with it but I cant wait to hear him play it so I can sing along to it. and last year when I heard Michael Murphy sing it on NZ Idol well that just took my breathe away. just for singing that song he should have won. I love that song! It is 1 of Eric's best ever songs and you just no that it came from a place right down deep inside where no one can see. To be quite truthful, I was always into the classic rock phenomena. The first time I heard Eric Clapton's music was I Shot The Sheriff. Following this I decided to pick up his best of album and the first time I listened carefully to the words of Tears in Heaven, I was shocked. I mean, for a man of his standards to write a song about his 2 year old son that fell to his death like that was just astonishing. And it brings questions to the mind that would normally perturb a man if a situation like this had ever arisen. Does his son even know who he is? Shivers up my spine, every time I hear the song or the name of it. Eric has brought a new meaning to the word song. I'm not going to say what everyone else has like best song ever and all but this song is different. It's filled with heart wrenching emotion, and no one can take that away from the song. I first time I listened to the song, I was speechless. No words can describe the feeling you feel listening to this song. I listen to it all the time and it always gives me the same feelings. It will forever be the a great and remembable song. Tears In Heaven is the very best song ever. I heard it a while ago and it was my math teacher playing on the guitar and a few of the girls in class singing. He learnt it for his daughter that lives with her mom so he almost never sees her but after that it's the only song I want to hear. I'm actually listening to it right now if you actually listen to the lyrics you kind of see what he was going through but not really only he knows that. I absolutely love this song. My mom showed me this song a while ago, and since then I have been playing it over and over. It takes my breath away, and almost makes me cry every time. If I could tell Eric Clapton anything, I would...........well first ask him to play it for me, then tell him that he is one of my favorite artists, in the world!! I love Eric Clapton's "Tears in Heaven". I had never heard of it until one day a friend of mine played it on his guitar and starting singing to it. I asked him what was that beautiful song and who wrote it? He told me Eric Clapton and from then on I have got the CD and listened to it tons more times. I always ask my friend to play it on his guitar for it sounds so beautiful when it's live. Tears in Heaven is a very sad song, but it one of the most beautiful I have ever heard..
Tears in Heaven is one of the greatest songs ever written. I tried to play it on Guitar and it took my breath away because it is such a masterpiece to play and those who listen to it were all mesmerised. It is indeed the best chord progression if you talk in technical terms. Whatever be the situation in which Eric wrote this and composed this, the world would have been sad to miss this song. This is one of the best songs written but still I really hate this song because of all the pain I feel when I hear it. On every funeral and memorial this song is played and it reminds me of my losses and all my sorrow, it all comes back each time I hear this song. I love Eric Clapton's "Tears in Heaven". 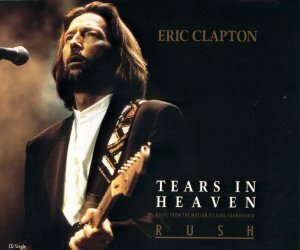 I remember when I was younger, my dad used to always play Eric's CD's and my favourite song was "Tears in Heaven". I always used to play it for my dad when my great-grandfather died, and it helped us get through the loss. "Tears In Heaven" is one of the best songs ever written. The first time I heard it I was in a car then it came on the radio and I just sat there listening and tears began rolling down my cheeks. When an artist has the power to make u feel his pain you know that they are truly gifted! Any time I listen to this it always reminds me of past loved ones and the joy they have brought on in their lives and put into mine I am grateful for Eric for bringing back memories of those who are no longer with me except in my heart. The song, "Tears in Heaven" is one of Eric's greatest songs ever written. It's terrible that it took Conor's death and Eric's grief to write such a beautiful song. Many people have requested this song played at their loved one's funerals, including me - my husband died of cancer in 1994 and when "Tears in Heaven" began, I don't think there was a dry eye in the funeral home. I saw Eric in Sacramento, CA a few years ago, and when he sang this song, he was a giant on stage. Actually, every song he sang he was a giant, an ICON. I love Eric Clapton for what he has given to the music listeners of the world through his joy, sorrow, etc. Eric, you are one of the best. I am a blues music listener and you are one of them at top of my collection. "Tears in Heaven" still brings me to a lump in my throat and tears in my eyes, for I feel his pain. It is a beautiful song.